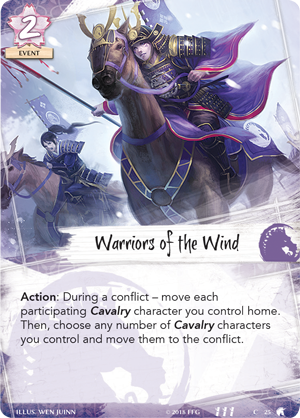 Fantasy Flight Games is showcasing some brand new cards coming in the Warriors of the Wind Clan Pack – Clan Unicorn is ready to charge! Clan Unicorn might not strike fear into your heart because of their name but you should never underestimate them in battle. Capable of surprising feats of speed and the ability to rally LOTS of cavalry units into a fight quicker than you can react, Clan Unicorn is a worthy opponent on the tabletop. 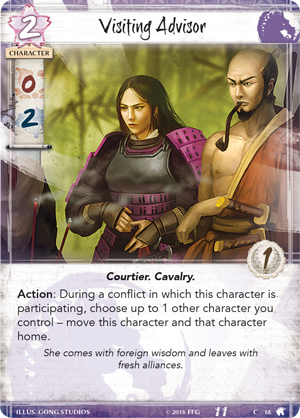 And now, with their Clan Pack on the way from FFG, they are getting even more cards in their arsenal to use on their march to war. 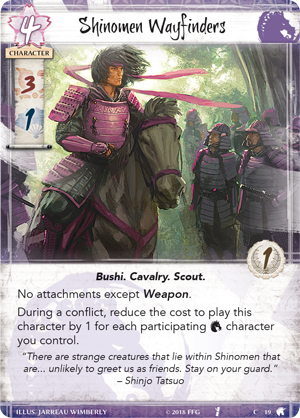 The Unicorn are unique among the Great Clans of Rokugan. While their gaijin customs often put them at odds with more traditional samurai of the Emerald Empire, the military tactics they learned in their travels throughout the greater world still serve them well to this day. 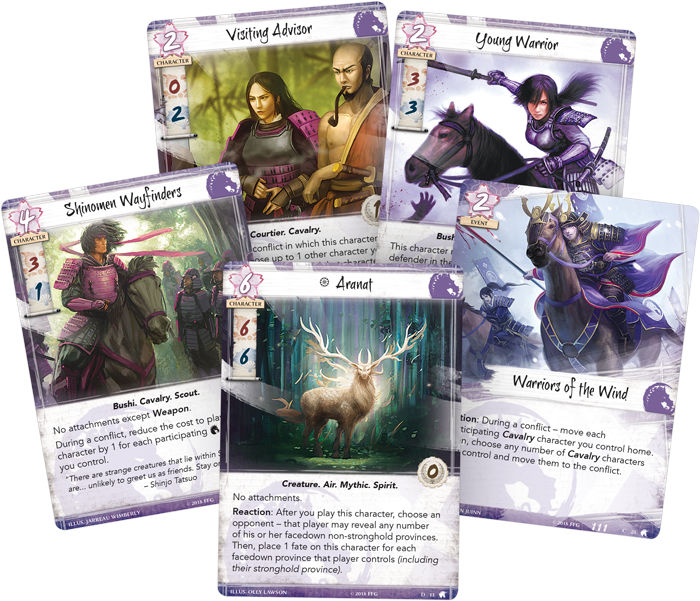 These tactics are expanded upon in the Warriors of the Wind Clan Pack, which contains 78 new cards (three copies of twenty-five different cards and one copy each of three different cards) and celebrates everything that makes the Unicorn Clan great. 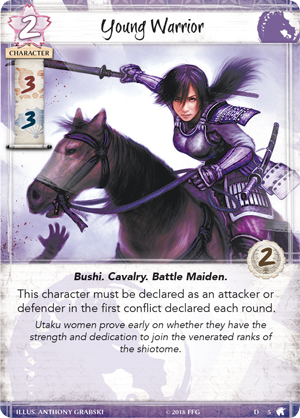 While the clan pack introduces new themes like exploration, it also enhances Unicorn strategies that have existed since the Core Set, including their dominance in early conflicts and their ability to manipulate participants in battle with mobile Cavalry characters! Aranat is a potent spirit card that boasts an impressive 6 military and 6 political power. 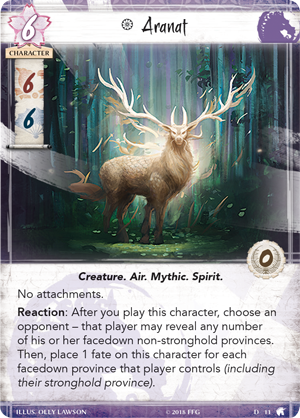 Summoning this Mythic Spirit will cost you the majority of your fate for the turn so it’s certainly a power-play move. However, dropping this new character card can really work to your advantage. 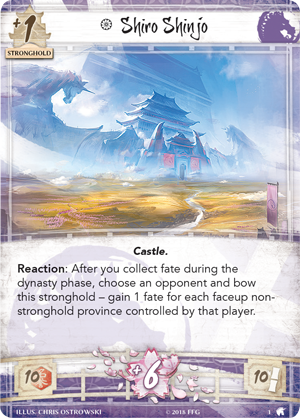 The target opponent must reveal facedown provinces or this card gets fate for each one still facedown. That can lead to the Aranat sticking around for many turns – and who doesn’t want a 6/6 on their side! Shinomen Wayfinders doesn’t have very impressive stats for 4 fate. However, the fact that it gets cheaper during a conflict based on the number of other Unicorn characters in the conflict means that you could drop this card for dirt cheap! Unicorn is all about bringing out tons of reinforcements during a conflict and this card just makes that possibility very cheap (and scary for your opponent). Young Warrior is cheap and has good stats – the down side is that this character wants to rush into battle. That can be good for Clan Unicorn however, because when the conflicts start, they typically have a lot of options. You can use Young Warrior to rush in and attempt to bait out ploys from your opponent, or you can have this character lead the charge for a big win early in the round. Visiting Advisor is actually a really nice combo card with Young Warrior. You can have the Warrior charge in to start a conflict then use the Visiting Advisor to step out of said conflict – ideally, this would be used to get your characters out of a bad setup. Essentially, it’s a great way to feint an attack on your opponent – and if they don’t “fall” for the attack, you can always keep pushing and you might just break through! 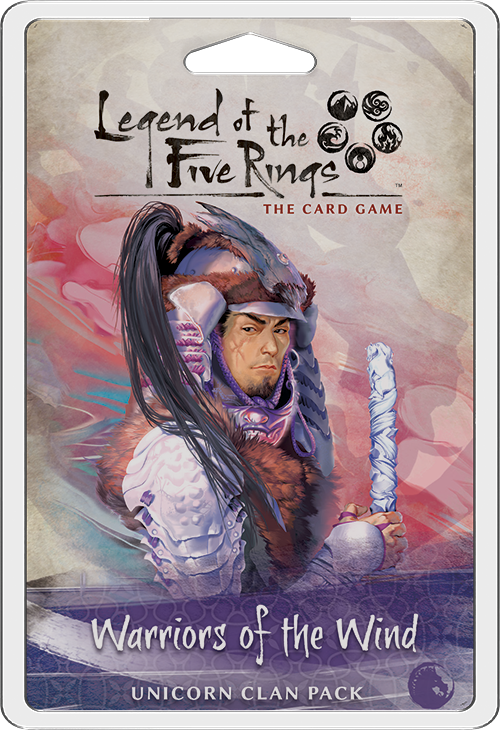 Shiro Shinjo allows you to collect even more fate on your turn. It combos very nicely with Aranat and rewards you for probing your opponent early to uncover different provinces. Possibly netting 4 extra fate a turn could really tip the scales in your favor. Warriors of the Wind should really be called “the ol’ switcheroo” because that is exactly what this card does! A two cost event that lets your retreat with one set of characters and then immediately return with another set! Or, if I’m understanding this card correctly, you could even add those same characters that retreated BACK into the conflict. Whatever the case, this allows for you to dictate the terms of an engagement which is pretty powerful! Don’t underestimate the Unicorn Clan. They WILL surprise you!